Alright Bills fans, Senior Bowl and Pro Bowl weekend coming up. Naturally a lot of your questions are drifting toward the NFL draft. Here is the latest edition of your questions from AskChris@bills.nfl.net and on Twitter @ChrisBrownBills. I watched your interview with Buddy Nix and after seeing the hiring Coach Marrone do you think the Bills will draft a QB in the 1st Round or is a free agent a consideration? Also do you think the Bills would draft a player with off field issues like Tyronne Mathieu (Honey Badger) from LSU if available in later rounds to play as a Nickel corner? Thank you for keeping us fans informed during the Offseason!! CB: I think a first round quarterback is certainly a possibility, especially in light of what Buddy Nix said late last season. He felt that they’re at a point where they may have to draft a QB a round earlier than where they have him graded. A free agent pickup is also a possibility because Nix has said they are likely to add one in the draft and possibly also in free agency. I’d be surprised if they draft a player with a questionable background like Mathieu. Immensely talented, but I just don’t see it happening, and he won’t be available in later rounds. He’ll probably be a second round pick. @ChrisBrownBills who are the offensive quality control coaches? CB: Buffalo has two quality control coaches on the defensive side right now. It’s my understanding they intend to hire two more on the offensive side of the ball. On defense Brian Fleury and Jason Rebrovich are the defensive quality control coaches. Fleury is a former college quarterback at Towson and most recently served as secondary coach and special teams coordinator at his alma mater. Rebrovich has been a defensive line coach at the college level for most of the past 11 years. He most recently served under Doug Marrone at Syracuse as a defensive assistant. He played his college ball at SUNY Cortland. He also has a background in strength and conditioning. Rebrovich is a native of Clarence, NY. Where do you think QB Nassib will fall in the draft, and would it be too risky or too much of a reach to go get him? CB: I think you’re asking if it would be too much of a reach to take Nassib with the eighth overall pick. The answer to that is if you like a prospect enough and believe he can be a franchise quarterback for you then you take him no matter where you’re at. 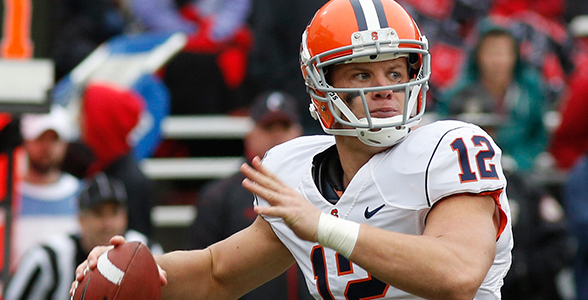 Nassib coming into the pre-draft process was widely projected as a second-round prospect. But with this not being a banner year for quarterback prospects I would expect his value to rise as we get closer to late April. So it wouldn’t shock me at all if he’s a first-round draft choice come the spring. I really like the hiring of Marrone, and Pettine was a good hire too (he will surely have a more exciting defense than his predecessor). While I have my concerns with Hackett, I now feel like they have committed to something. My feeling is that once you commit you can’t do anything half-heartedly, and that’s why I think they now need to go after Ryan Nassib at #8 overall in the draft. What is the likelihood of this and what would be the advantages/disadvantages? . . . Is Nassib worth that high of a pick, and do you think it would be a wise choice to have HC/OC/QB all from the same program? . . . If that happens, I wouldn’t think trying to nab WR Alec Lemon in the draft would be out of the question either. What are your thoughts? CB: I think there is merit to that line of thinking. It’s hard to know exactly what the Bills prefer with respect to quarterback, but they do have an affinity for Nassib and understandably so. They spent the past three years with him as their QB. Most scouts think his game still needs some polish, but he has all the physical traits you look for. Quarterbacks as I mentioned above tend to rise up draft boards late in the process because of the importance of the position. The obvious advantage is Nassib would walk in the door knowing the offense better than anyone else on the roster. The transition from a scheme standpoint would be seamless. That could also shorten his learning curve where he could focus more on diagnosing defenses. We saw this to some degree with Ryan Tannehill in Miami last year. The only disadvantage is the expectations would probably be higher on him knowing he’s in the same offense. So if there are early struggles, provided he starts (and we’re really getting ahead of ourselves here), that could potentially backfire I suppose. With respect to Alec Lemon he had over 1,000 yards receiving and eight touchdowns last season in the Orange offense. He was a late invite to the Senior Bowl. But the receiver class is deep this year. So I tend to think that happening is less of a likelihood. Nassib is widely seen as one of the top five to eight QBs in the draft. So the odds for him one would think would be greater. We know that the Bills are drafting No. 8 overall in the first round ahead of the Jets, even though both teams finished with the same 6-10 record. What happens in the second round? Will the order be reversed, with the Jets picking ahead of us? I raise the question because if the Bills don’t believe that there is a QB that grades out worthy of the No. 8 overall pick, they might be targeting that second round pick, and it wouldn’t be a surprise to see the Jets draft a QB as well. Especially, now that we have their defensive coordinator, I can see where the Jets might want to try to “one-up” the Bills. What are your thoughts on this Chris? Thanks for your great coverage. CB: The Bills were in a similar situation last season. They were one of three teams that were 6-10. Miami and Carolina were the others. Since Miami and Carolina only managed six wins against a weaker strength of schedule they picked ahead of Buffalo in round one. The order was 8-Miami, 9-Carolina and 10-Buffalo. In round 2, Miami moved to the back of that group to pick 10th, while Carolina and Buffalo moved up to 8th and 9th in that round. That rotation continued in round 3 (Buffalo – 8th, Miami – 9th, Carolina 10th). This year, it’s again a three team situation at 6-10, with the Bills, Jets and Titans. Buffalo picks 8th in round one, Jets – 9th, Titans – 10th. In round 2 Buffalo will pick 10th, with the Jets moving up to 8th and Titans to 9th. So your argument is understandable, but personally I think the bigger concern is Arizona, which will pick 7th or 6th in every round. They clearly need a quarterback and are more of a threat. I think Philadelphia (4th) and Cleveland (6th in round one, 7th in round 2) could also be QB picking threats if their new coaches don’t like what they’ve already got on their roster. And those three teams pick ahead of Buffalo in every round. For more on determining tiebreakers in the draft order you can read the full process here.